On a multimillion-dollar construction project, even a small increase in productivity can yield millions of dollars in additional profit - as well as a safer and more efficient work environment. Yet many engineering and construction firms overlook analysis tools that would help improve productivity. This book focuses exclusively on investigation and analysis techniques that support the implementation of productivity improvement programs. 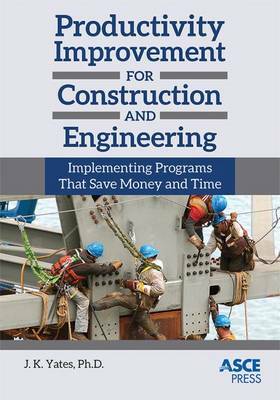 It addresses productivity improvement from both engineering and construction perspectives and provides detailed case studies that illustrate the implementation of productivity improvement programs. J.K. yates lays the groundwork by defining what it means to improve productivity and summarizing contemporary approaches to productivity improvement programs. The human component of productivity improvement is addressed. Then the reader is taken step-by-step through stages of investigation, data analysis, evaluation of alternatives, and project management. In addition to covering traditional productivity improvement topics, this book also includes information on new and emerging areas, such as building information modelling (BIM), sustainability concepts, computer simulation modelling, and global productivity Issues. Engineering and construction industry professionals will use this book to critically analyse work processes and to design programs that increase production rates at engineering firms and construction job sites.